New XPS 15 takes visual cues from the wildly successful XPS 13 while adding in Windows 10, Intel Skylake, and USB Type-C 3.1. 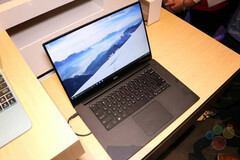 The latest XPS 13 has been a hit with its attractive thin bezel and all-around excellent performance. In fact, it still holds the top spot in our Top 10 list of Ultrabooks after almost 6 months in the market. Now, Dell is ready to update the XPS 15 so it can carry the same thin bezel and chassis as its successful smaller sibling. Revealed just yesterday at the Microsoft conference in Taipei, the refreshed XPS 15 will come with a 15.6-inch 4K touchscreen and is expected to house Intel's Skylake generation of processors. Its thin bezel is reportedly only 5 mm for an almost edge-to-edge glass screen and will be one of the first notebooks to incorporate USB Type-C 3.1. Elsewhere on the device, the XPS 15 will mirror the carbon fiber and aluminum body of the XPS 13. We don't expect the notebook to be available until later this year after both Windows 10 and Skylake have launched. Additional details from Dell have so far been sparse, but our German source has additional images of the prototype device.